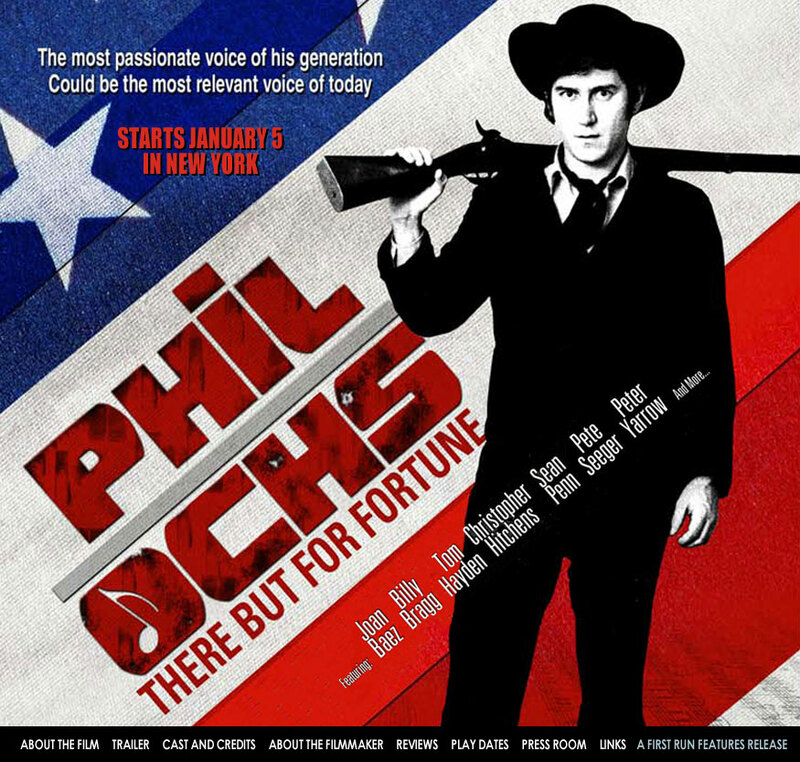 THE CULTURAL WORKER by John Pietaro: FILM REVIEW: "Phil Ochs--- There But for Fortune"
Directed by Ken Bowser (www.philochsthemovie.com). Released, January 2011, IFC Center, New York, NY; premiered at the Woodstock Film Festival, Woodstock NY, 2010. 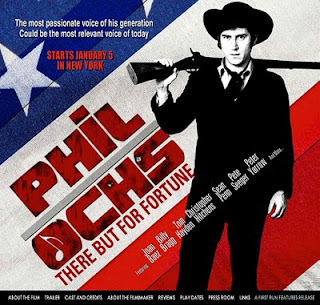 Documentarian Ken Bowser walked up the aisle to the front of the IFC Center in Greenwich Village for the premiere of ‘Phil Ochs: There But for Fortune’ and explained that this film was some twenty years in the making. Twenty years for a documentary about a folksinger of a time that now seems far into the past, one who never lived to know of his place in the annals of topical music. Citing that Ochs’ brief life and briefer still career fell far short of the popular acclaim he struggled for, Bowser reminded the audience that, “it’s important that we who love Phil Ochs and understand his relevance let others know”. It was never supposed to be a closed society of the initiated, so spread the news---all the news that’s fit to sing. The protest singer’s vibrancy in performance, the visceral stir in his voice and the earnest plead on his face are back. The music’s depth, the urgency of the day and the living movements that Ochs was so central to are visible for all to see. Leaning awkwardly over a microphone while cradling his Gibson 6-string, James Dean haircut spilling over his forehead, cocked eyebrow revealing sardonic wit while the mouth produces an earnest portal for songs of pride and revolution, Ochs erupts onto the screen, something of a celluloid hero. Within the cinema that was once the legendary Waverly Theatre—a site frequented by Phil in the ‘60s, walking distance from his Bleeker Street apartment—it was easy to feel transported. And necessary. These times, too, need Phil Ochs. At least partially erased from popular memory, Ochs is recalled today in an awkward hush. But wasn’t that a time? The singer didn’t just burst upon the early ‘60s folk scene intact--he was crafted out of pure determination and idealism. The product of a challenging, to say the least, childhood (Ochs’ sister Sonny and brother Michael both attest to their manic-depressive father and coldly disconnected mother), young Phil tended to be a loner who idolized film stars and fostered a burning, secret desire for fame. “The psychosis of the Eisenhower era”, as record producer Van Dyke Parks described it, implanted in Ochs’ the conflict that was to mark the years of protest to come. Deeply patriotic, the teenage Ochs began to understand something of the injustice in his midst and he began to see beyond the surface. In college while studying for a career as a journalist, Ochs befriended folksinger Jim Glover who introduced him to the music of Woody Guthrie and the Weavers; his writings took a notable turn to the left. And after years of study on clarinet, Ochs obtained his first guitar, winning it from Glover in a bet when he wagered that Kennedy would beat Nixon in the ’60 election. Ochs never retreated. The writing of topical songs came easily---they flowed at a blurring rate and offered up-to-the-moment social commentary. Phil noted that “every newspaper headline is a song” and before long his performances in Greenwich Village nightspots led to a major record contract and a national tour. The film offers a look into the tumultuous relationship he shared with another stalwart of the Village scene, Bob Dylan. While they were friends as young men, Dylan’s star shined considerably brighter than Ochs and as he rose to new heights, Ochs always felt at least a step behind. The rivalry haunted him. Still, Ochs’ impact was deeply touched by the activists who soon felt forsaken by Dylan. Cultural critic Christopher Hitchens, among the notable talking heads who offer wonderful insights, stated that “There was a difference between those who listened to Dylan and those who even knew who Phil was. Anyone could like Dylan”. Eluded by wider popular acclaim, he staunchly maintained an immersion in protest music even as he graduated beyond its standard fair of singer and guitar. By his third studio album, Ochs’ transition was not into the realm of folk-rock--as his peers had moved into--but to an expansive, concept-driven format that made full use of orchestration and a variety of genre. String quartets, honky-tonk piano, woodwinds and electronic music provided a sweeping soundscape for Phil’s resounding tenor. Seemingly always aware of, yet in battle with, the tragic destiny of mental illness that would later claim him, Ochs fueled his passion with alcohol and work. But the brilliance of his music was never enough to satisfy the burning restlessness within the man or his conflicted self-image, equal parts self-important and shattered. ‘Phil Ochs: There But for Fortune’ offers powerful insights into the choice songwriter of in-the-know progressives. The film is a whirlwind tour through his music, his politics and his personal demons, with stopping points which include skillfully edited performance and interview footage, news reels and rare photographs. First person remembrances are provided by Ochs’ family as well as fellow folkies Pete Seeger, Joan Baez, Dave Van Ronk, Jim Glover, Judy Henske, and Peter Yarrow (the elusive Dylan was, as Bowser described, unavailable for interviewing). Overall, the film is a fascinating view into the urgency of the times, the movement culture, and the folksong community’s response to Civil Rights, Vietnam, labor strife, and the murders of the Kennedys, Medgar Evars and Martin Luther King. Ochs was inflamed with activism and willingly thrust himself into the street heat---this is where he differed from the rest! Other important historic segments in the film are the interviews of Yippie founders Paul Krasner, Ed Sanders (of the Fugs) and, via archival footage, Abbie Hoffman. Hearing the personal recollections of the debacle of the 1968 Chicago Democratic Convention protest, along with footage of the police riot and ensuing despair, was riveting. Tom Hayden, never far from his radical roots, again offered moving commentary. The assaults by the Chicago police, the loss of an anti-war presidential candidate, and the dissolution of the activists base, post-’68, had a terrific impact on the already wavering Ochs. Sanders said that Phil saw the protestors as, influenced by 1930s radicalism, part of “a united front against the war”. Once it was broken, he began to state that he’d died in Chicago along with democracy---or at least the movement. While Ochs later years are painful to observe, the power of the songs stands strong. It is almost unfathomable that Ochs was only 35 at the time of his death. Yet Bowser is sure to illustrate some of the exciting highlights of his later period, including his organizing of large-scale events such a his celebratory ‘the War Is Over’ concert in Central Park and the ‘An Evening With Salvador Allende’ in honor of the Chilean people whose radical democracy was stolen from them by a US-backed coup. Overall, the film does exactly what we, who have been waiting for something, want it to do. It offers a close-up view of this man who has often been deemed the protest song’s grandest voice. You’ll peer into the broken life of Phil Ochs but this image will be far surpassed by his promise of a new day. And, hell, if this is not enough to inspire you to attend the next rally for social change, then the music cannot miss. “I Ain’t Marchin’ Anymore”, “Changes”, “The War is Over”, “White Boots Marching in a Yellow Land”, “Draft Dodger Rag”, “My Kingdom for a Car”, “Chords of Fame”, “No More Songs”, “Links in the Chain”, “The Ballad of Medgar Evars”, “Harlan Kentucky”, “We Call for No Wider War”, “When I’m Gone”. “There But for Fortune” and it rolls on and on, through the decades and the next senseless war. Nice job, John. I loved Phil Ochs. I saw the movie. It was awesome. I'm glad this film is helping to get exposure; it's so important that the younger generations know his story, and experience his music. Thanks for the kind words and helping to extend the message----I would love to see the film move out internationally; it deserves it and society deserves to learn much more about Ochs.